Let us go back in time: little ZWR sits at his desk in his fine little neighborhood parochial school, looking adorable in his clip-on plaid tie, and his teacher (we'll call her Miss Poopypants) draws his attention from doodling when she says, "rain happens when God cries, so don't do anything to make him upset." Instantly his hand shoots up. "Couldn't those be tears of joy, Miss Poopypants?" We have one of our standard debates, and shortly thereafter I'm sent to see our principal, Father Donkeybutt. VINDICATION came last night, Poopypants!!! Another scene: Roy Halladay is, unsurprisingly, battling. From it's infancy, this season for Halladay has been rife with doubts, and now at its latest point-- the seventh inning of an April evening affair with the St. Louis Cardinals (who just so happen to represent one of the most soul-crushing moments in recent team history)-- an opportunity for validation of those concerns has seemingly presented itself. Roy surrenders a home run to Matt Holliday. He has labored to throw strikes, an offshoot of mechanical concerns. His pitch count is creeping up. Beltran and Craig are going to come to the plate. Might this get ugly? No. It might not. 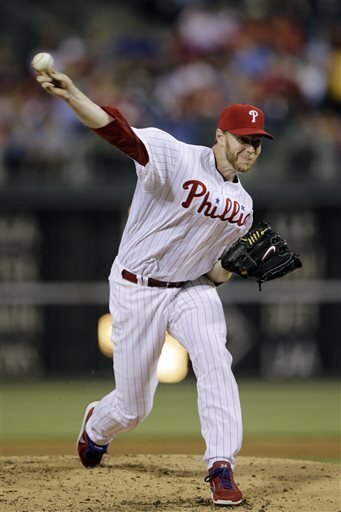 Harry Leroy Halladay III ends the inning without giving up another hit. He's now gone seven innings and given up TWO HITS. Philadelphia rejoices, rightfully. Our hero just did something heroic. And then what happens? The skies open up. Roy Halladay didn't just make up happy, last night. He made God erupt into tears of joy. What, no line? I gots to have a line! God saw Durbin warming up, and he cried. But Zoo, what's the line? I gotta have the line!